Marketplace and BBC World Service announced Tuesday a new daily global business broadcast, “Marketplace Morning Report” from BBC World Service. The new broadcast launches Tuesday, Sept. 5 on U.S. public radio stations nationwide. The program will be hosted live from London by the BBC’s Anu Anand, who has more than two decades of experience as a global journalist. Many thanks for the tip, Howard! Marketplace with Kai Ryssdal is one of my favorite radio broadcasts–I rarely miss it. I’m looking forward to the new Marketplace Morning Report collaboration. This entry was posted in Broadcasters, News and tagged APM Marketplace, BBC, BBC World Service, Marketplace Morning Report on August 16, 2017 by Thomas. Interesting. Other countries that are similarly vulnerable include Greenland, Cuba, North Korea, Libya, and Tunisia. 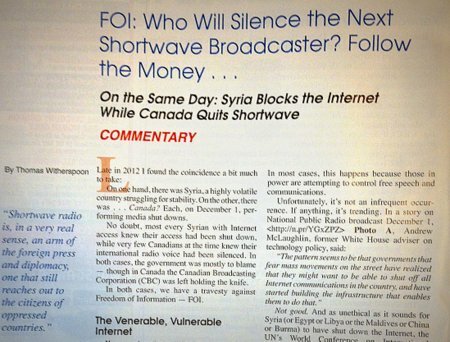 A few months ago, I wrote a post on this very topic, entitled: Syria stifles the Internet while Canada stifles shortwave. I’m pleased and gratified that Popular Communications Magazine picked up my article; it’s published in their April 2013 issue. Shortwave radio is not the solution to all communications needs, of course, but it is certainly the only international broadcast medium I know of that is impossible for a country like Syria to completely shut down. As I’ve said before, shortwave radio has no regard for national borders, requires no subscription, no apps, no computers, and is nearly impossible to trace to the individual(s) using it. It is free speech, for free. Tagged under our growing category: Why Shortwave Radio? This entry was posted in News and tagged APM Marketplace, Free Press, Freedom of Information, Syria, Why Shortwave Radio on May 10, 2013 by Thomas.